Who’s ready for a memorable Texas escape? 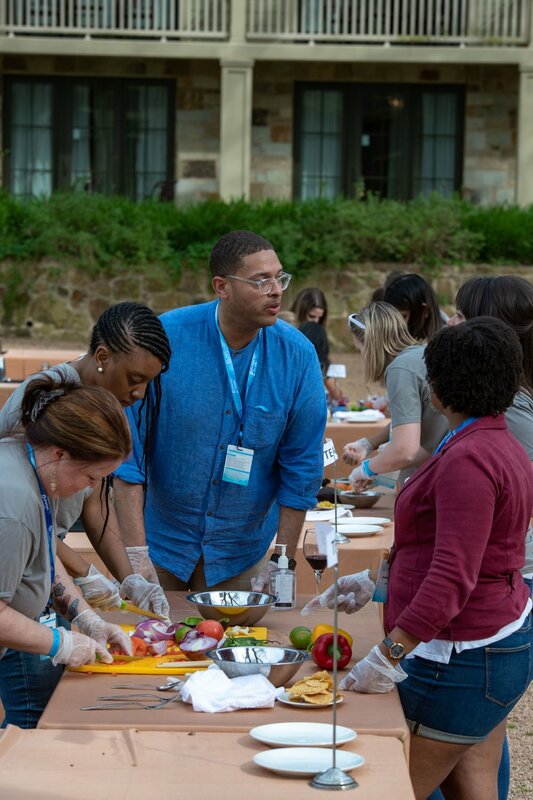 Hidden on 80 miles of magnificent trees, sporting a cool lazy river and glorious sunsets is the Lost Pines Resort in Austin, Texas – home to the 2019 Talent Brand Alliance Summit, a two-day conference for a community of employer brand builders and employee experience storytellers. 1. There are no experts – as this field continues to grow, it’s the value of our collective knowledge that will propel us forward. 2. Technology and tools underpin our success, thus evoking passionate discussion (and healthy debate). 3. Connections matter most – it’s those moments in between that provide the most value to your career and personal development. 4. Add a touch of spice and see what happens with your recipe -- don’t be afraid to experiment to propel your team and company forward. Beaming with excitement and pure passion for knowledge sharing were Bryan Chaney and Will Staney, our summit hosts. They set the perfect tone of what to expect of this experience – my favorites being the rules for engagement (re: there are no experts! ), the round table discussion format vs. your typical conference stage presentations and breakdown of unconventional team building that lay ahead. Day one found me at table nine, along with practitioners from Alaska Airlines, Ultimate Software, Autodesk, Dell and more! As facilitators took the floor to walk us through thought-provoking topics, each member at the table took a turn sharing what we’ve learned in the EB space at our respective companies, and then applied those experiences into pieces of advice for each other. What I loved most about this format is that the discussion never focused on titles or tenure in the business; instead, we exchanged our ideas, challenges or opportunities, and explored how we could work together to find a solution together as a community. When it comes to tricks of the trade, there are dozens for employment branders! As talent branders, we have a playground of tools to use, including social media monitoring, video, and photo editing, even blogging and content management platforms. One of the facilitators, Jamia Belton, took the floor to facilitate this discussion – and to the average person, what could have been a session to vent about the pain points of tech, turned into a session on how to best work with technology to meet our goals. This session left everyone feeling much lighter, understanding that everyone has experienced tech blunders, and the value was in learning from those moments and finding ways to make it work for your storytelling strategy. Tip for selecting conferences: Be purposeful in your selection of conferences that have sessions dedicated to your expertise or an area where you want to grow. While the content was amazing, the connections formed are what will bring me back next year. Most conferences have you shuffling from one session to another; however, the summit was unique in that the sessions were centralized in one room, allowing attendees to settle in, free from distractions, with a lot of intentional breaks for attendees to meet new people. Noticeably, folks sought out new people during a coffee or lunch break to expand their networks and their view on the talent brand space. Keeping this in mind, I sought after meeting all types of people! To my surprise, I was found to have a lot in common with many members of Talent Brand Alliance, and immediately encountered a group of attendees who pledged the same sorority/fraternity in college. Another connection point was found when I ventured outdoors for a morning run and passed by another attendee in a #TBSummit shirt and was greeted a cheery smile and a wave, then another waiting in line for archery when I struck up a conversation with the person shooting arrows next to me. It was those unscripted opportunities where I could feel the genuine energy of others and I was most proud to be a member of this community. Tip for networking: Connections matter, try finding out the unique things you have in common, and that’s how you can foster a relationship beyond the event. If you find out you don’t have much in common, it’s okay -- you can still act as a resource for each other. Many more bonds were formed when the event capstone Iron Chef Competition brought out teams of five to create a culinary experience before our farewell dinner. Racing against the clock to create our own versions of salsa and guacamole from fresh ingredients, our team was all about the spice! For the judges to get a flavor for our team, Cabo de Spicy, we each added a uniqueness to our recipe for success, one person was responsible for cutting, one mixing, and the other plating. It was a great dynamic, and when it was time for seasonings, the spices were mild at first until we decided as a group to amp it up, believing that a little “kick” to any recipe was sure to be a winner, and to our surprise, we swept first place! Tip for practitioners in understanding team dynamics: Great leaders take the time to get to know their teams and quickly identify each person’s strengths or uniqueness. Once the team understands their role, the team will thrive and make the most kickin’ recipe (aka strategy). No goodbye, only see ya later. From the engaging round-tables and s’mores fueled chats by the fire, to networking over tomahawk throwing, it’s easy to say that I had an unforgettable time at my first Talent Brand Summit! I’m proud to be a member of this community that underlines the importance of our role as talent branders and recruitment marketers. While the Summit is over, I’ll be continuing the conversation in our Facebook group and offline with the connections I forged. Briana Daugherty works for Cox Enterprises as an Employment Brand Strategist championing company culture and employee stories to attract and retain the coolest and brightest employees to the Cox family of businesses. Devoted alum from Georgia Southern University, Briana lends her talents to local nonprofits, career mentorships, and faith-based ministry. After hours, this avid movie watcher, ultimate planner of friendly "get-togethers" and die-hard lover of Oreos is a ball of fun and brings much laughter and conversation to any gathering. Follow her on Twitter at @brianaPR.